It’s been a while since the last Edulog as you can see I’ve been in jazzland for a while. Here finally is the video the kids (7 SEN 8/9 year olds) made using stop-frame animation and Moviemaker. It took a while but for them, it was worth it for their enjoyment and learning, and for me, something permanent to take with me as I begin a new teaching discipline as a Dyslexia/SpLD teacher. I know its rough and ready but the quality isn’t the point. They loved the whole Celts/Romans/Gladiators thing (especially that the Celts made their hair stick up with clay and pee!) and whilst improving their historical and geographical skills, they had a hoot making it. There was input from me but only as far as guiding them and modelling what they had to do. The main guts of it was done by them. The models, photographing, importing sound and images and inserting slides etc. As far as technical stuff goes, they imported photos into WMM and I set the default display time to the quickest 0.125 secs to display each frame. They had experience of editing from when we made the Fireworks video for the Innovative Teachers Awards. We also did a rap which we didn’t have time to completely record but maybe I’ll find time to go in and finish it next term on my day off- (yes folks- 4 day week for me as SpLD teacher…*smokes cigar*). This is the Dabbleboard page we wrote the rap on over a period of time, we did do some collaborative linkage using Dabbleboard with the wondrous Jan Webb (Webb’s Wide World) and her class during the time Skype was being an utter pain. 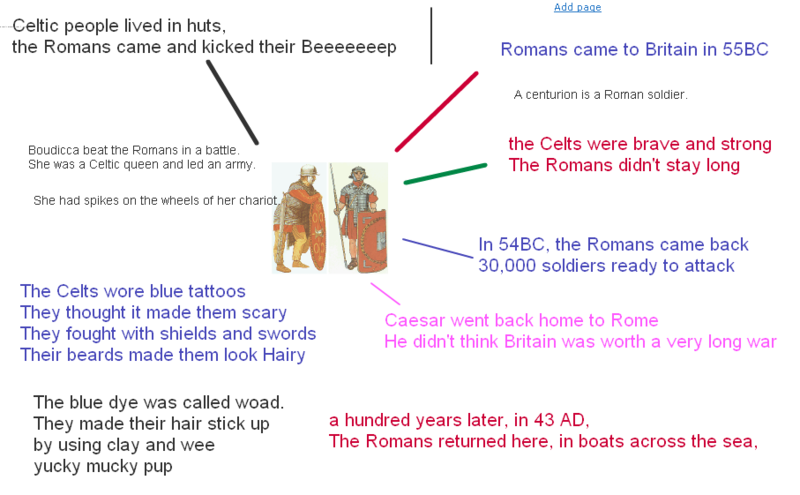 Even after some time after the topic had finished, all the class were able to remember some if not all of the factual information about the Celts and Romans because of the movie and rap they created. Given that some of them had a struggle to remember what they did on the weekends, this is quite a feat.